Regular readers will know that I’m excited by the potentials for far-offshore floating wind turbines. Less construction noise, less disturbance of the seafloor, more construction can take place on land rather than at sea (meaning less loud boat activity)…..it all adds up to much less noise impact in our coastal ocean environment, which is very sensitive to new noise. Not only that, but the winds are stronger farther out. Renewable Energy World has a great current overview of where the R&D is at today for floating turbines, with summaries of each of the leading designs being tested, and assessment of the likely timeframe (the cautious among them still say we’re a decade away; some are more bullish). Some of the commenters throw in the bonus idea that these installations could add wave energy generators as one way to address the higher costs the floating technologies. 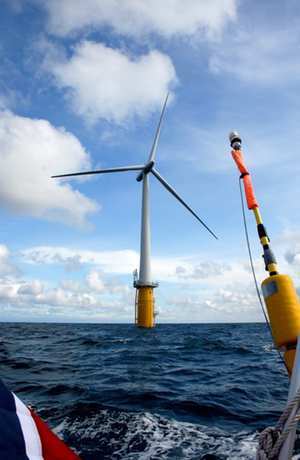 IMAGE: Developed by Norwegian energy company Statoil ASA, Hywind is the world’s first full-scale floating wind turbine. Located around ten kilometers off the southwest coast of Norway, the structure itself is a steel cylinder, similar to a spar buoy, filled with a ballast of water and rocks, which extends 100 meters beneath the sea’s surface. Attached to the seabed by a three-point mooring spread, it can be employed at ocean depths of 120 to 700 meters. Did wind farm reduce nearby property values on Wolfe Island? A couple on Wolfe Island, Ontario are asking their local officials to reduce the valuation of their home by about 17% due to its proximity to a wind farm that began operating two years ago. Wolfe Island is in the St. Lawrence, and sits a couple miles from the New York town of Cape Vincent, where another wind farm is planned. 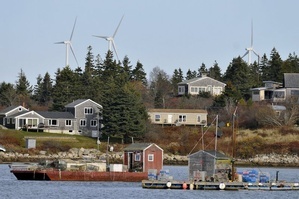 Ed and Gail Kenney had their home assessed at $357,000 just as the wind farm construction was beginning; a more recent appraisal in early 2010 came in at $283-295,000; the appraiser said she took the proximity of the wind farm into account. The Kenney’s home sits just over 1 kilomerter, or six-tenths of a mile, from the nearest turbine. Their claim asserts that the lights and the noise from the turbines are the factors that reduce the value. UPDATE, 4/16/12: The Assessment Review Board ruled that proximity to wind farms should not be a factor in county assessments of properties. The Kenneys claim that virtually no homes have been sold near the turbines on Wolfe Island since the wind farm became operational. As noted in AEI’s previous coverage of property values research, while there is little evidence of decreased property values due to seeing turbines in the distance, there is less clarity about whether values decrease within a half mile or mile, where noise issues become a factor. As in the Dufferin County sales, there are generally too few sales at close range to produce statistically significant trends one way or the other. In 2008, several property owners near a Prince Edward Island wind farm had their property values reduced by the town by about 10%. Developers of two different wind farms in Ontario – one of the Dufferin County farms and one in Ripley – have purchased several homes from neighbors after they found noise of the turbines disruptive. UPDATE, 10/1/11: This story from the CBC discusses several homeowners in Ontario who have been unable to attract buyers or who sold for a loss after a wind farm began operating nearby (including four of the homes bought by developers). At most of the places where the National Park Service and FAA have commenced air tour management planning (ATMP), there is already a deeply entrenched local air tour economy, as well as a visitor expectation that they can take flight in order to see the beauty from above. The Grand Canyon is of course the Mother of All Overflight Controversies; similarly, the the Black Hills/Mt. Rushmore and Hawaii Volcanoes ATMPs also dove into situations where thousands of annual flights were already taking place. But now for something completely different: At Mt. Rainier National Park near Seattle, only 114 flights are currently allowed each year, with actual numbers apparently lower. This provides a rare opportunity to give real consideration to Alternatives that truly maintain natural quiet on the mountain. The Park is currently accepting comments on a set of draft alternatives for use in the ongoing EIS process. Two of the proposed alternatives would greatly reduce noise in the park backcountry: Alternative 1 simply bans all flights over the park, and Alternative 4 keeps planes to the far periphery of the park, and at high altitudes. Alternative 3 allows 55 flights per year to circle the peak, and introduces the NPS’s recent innovation (being spearheaded at the Grand Canyon) of setting aside no-fly times – in this case, weekends, and sunrise/sunset on Monday-Thursday, and keeps planes at 2000 feet or more. Alternative 2 maintains current use patterns around the peak, capping flights at 114 per year. Truthfully, any of these options will maintain Mt. 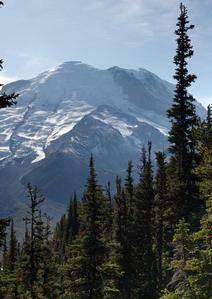 Rainier as a place where hikers can experience the natural soundscape with minimal intrusion. But, the opportunity to establish a precedent for keeping commercial air tours out of relatively pristine National Park lands is one that is worth keeping on the table; we encourage support for the inclusion of the “no air tours” alternative. Comments are being accepted through May 16. And remember, comments are being accepted through early June on Draft Alternatives at Hawaii Volcanoes National Park, too. There, Alternatives range from 28,000 flights per year to “no air tours” (though this will allow flights around the periphery, and over 5000 feet within the park). You can read about the process and comment here, and you can download the alternatives here. Suncor and Acciona Energy recently purchased four homes near the 38-turbine Ripley Wind Power Project, buying out several neighbors who had been pushing the companies to deal with noise issues at their homes. The Ripley-area residents had approached municipal council in 2009 about a rash of health problems, “including high blood pressure, headaches, sleep disturbances, the sensation of bugs crawling on the skin, humming in the head, non-stop ringing in the ears and heart palpitations,” they believed were caused by their proximity to the project. Maine’s Office of Energy Independence and Security has delivered a long-awaited report on wind farm siting to the state legislature. The lead recommendation is that the minimum distance between commercial wind turbines and residences be nearly doubled, to 1000 feet; current standards are based on safety, not noise, while the proposed increase is meant to address noise impacts. It appears that the 1000 foot distance is based on keeping noise levels below 55dB during the day and 45dB at night, which is what is required for all noise sources in rural Maine. Here at AEI, we noted that the experts consulted for the report did not include any acousticians who have suggested that lower noise limits may be necessary for wind farms than for other noise sources. We were pleased and somewhat surprised to see AEI cited numerous times, though in some cases our points were taken partially out of context and some points which were accurately presented were apparently ignored in coming to the conclusions. In particular, we were pleased to see that the report included our assessment of peer-reviewed Scandinavian studies that suggest that when wind turbine noise tops 40dB, annoyance spikes in rural areas to 25-45% of those hearing these levels – though of course the 1000 foot setback guarantees that many of the closest neighbors will indeed be disturbed (it’s likely that those from 1000 to at least 3500 feet will regularly hear noise levels of over 40dB). Two citations of our work implied that very few wind farms cause noise issues, but left out the fact that this is because most are far from homes and that a much larger proportion of wind farms within a half mile or mile of homes do cause problems, especially in rural areas that are not working farm and ranch landscapes. Likewise, a citation suggesting that “Typically, between 5-20% of people, with higher levels of around 20% of people in rural areas, are highly annoyed by wind turbine noise” neglected to note these figures are for all those who can hear turbines at any volume or distance; again, the key point is obscured: that those within a half mile or so are apparently negatively impacted at a high rate, and those within a mile or so also likely to be more bothered. Even overlooking the subtle misinterpretation, I am left to wonder: is this report suggesting that causing a high level of annoyance in 20% of the rural population an acceptable outcome? As noted by many acousticians, community noise standards are typically set to minimize negative impacts more effectively than that. Read more at the Portland Press Herald, or: Download the full report.